To prepare Little Lucifer pack, using a fork or knife, poke holes into the pack and place directly onto the hot plate (using gas BBQ) and place lid down, allowing the chips to smoke. Line a BBQ tray with onion slices and place the butterflied chicken on top. Drizzle a generous amount of olive oil over the chicken and sprinkle a pinch of salt. Once the chips start smoking, place the tray onto the BBQ grill plate. Cook for 45mins – 1hr, until golden and cooked through. Coat corn cobs in olive oil and place onto the BBQ. Place lid down and allow them to cook for 8-10 minutes. Remove kernels from the cob by cutting them into a bowl. Cut pre-boiled baby potatoes into small chunks and place them on a large serving plate. Next, layer with kale, parsley, celery, and pear. In a small bowl, combine ZoOSh Creamy Potato Dressing with sour cream, then drizzle onto potato salad. 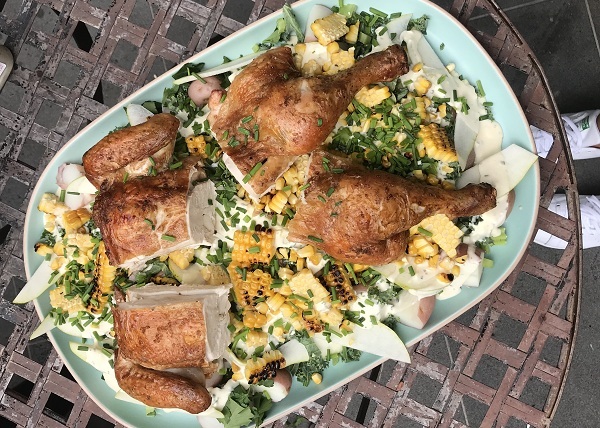 Top salad with charred corn. Cut chicken into quarters, removing the middle bone, and place on top of potato salad. Garnish with chives. Enjoy! *Save cooked onions for later!